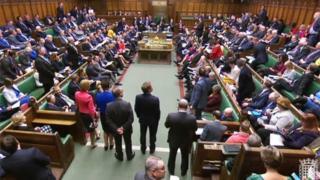 MPs are to receive a 2.7% pay rise from April, taking their salary to £79,468. MPs who chair select committees will also see a rise of 2.7% on the additional £15,509 they receive for that role - taking it to £15,928. The Independent Parliamentary Standards Authority said it had committed to changing MPs' pay in line with public-sector earnings. Its figures show the basic salary paid to MPs will have risen by £13,730 since April 2010. The rise follows a 1.8% rise last year, 1.4% in 2017, 1.3% in 2016 and a large hike, from £67,000 to £74,000, in 2015. Ipsa was handed control of decisions over MPs' pay and expenses in the wake of the 2009 expenses scandal and it does not need the agreement of Parliament to bring in the changes. MPs' pay is linked to average rises in the public sector, as determined by the Office for National Statistics. It announced the 2.7% figure on an interim basis in December and confirmed last week to IPSA. The above-inflation rise was criticised by the general secretary of the Public and Commercial Services union, Mark Serwotka, as "an outrage... while civil servants, who do some of the most vital jobs in society, are still subject to a cruel 1% de-facto pay cap." And Labour MP Kevin Barron said: "I am very disappointed to see that IPSA have this morning awarded MPs a 2.7% pay increase but only 1.5% for parliamentary staff. A Downing Street spokeswoman said: "The decision taken today is independent of government and Parliament. What government sets are ministerial salaries and they have been frozen since 2010."